Standing beside an artwork comprising a stack of bricks, Jamie Scott began the signature thumb gestures that begin Trisha Brown's solo, Accumulation (1974), to the Grateful Dead's "Uncle John's Band," and instead of of 41 years falling away, they seemed to compound and well up like a mini stormcloud of emotions, dumping its sentiments all over me as I sat watching on the floor of the Judd Foundation at 101 Spring Street. I thought of how the gesture is so emblematic of Brown, no longer performing; how she was one of the artist pioneers of the wilds of 1970s industrial Soho, where brave now means taking a pop-up store lease for more than a month. How she lived around the block on Broadway and commandeered the rooftops for her expansive site-specific performances. How the crossroads signs, Mercer+Spring, loomed through the window just behind Scott, signifying so many years spent on both streets, plying endless paths for work and life. How the jangly music was more of a time-stamp than the dance, written at a time when moonshots were realistic but rock was still in its youth. I imagine Trisha Brown: In Plain Site, the performance collaboration between the Judd Foundation and Trisha Brown Dance Company, was meant to evoke all these things and more. But most of all, it summons the moment in time when modern art met post-modern dance, and created an artistic biome that has not been surpassed in New York. The program runs today and tomorrow (info at juddfoundation.org). As we moved to the second floor, Marc Crousillat and Stuart Shugg performed an excerpt of Rogues (2011), a far more kinetic and space-eating dance to Alvin Curran's music. The space was surrounded by a wall mural of earth-hued, painted color blocks and huge windows with panes of original wavy glass. On the fourth floor, Cecily Campbell, Leah Ives, Olsi Gjeci, and Tara Lorenzen moved through the sublime Figure Eight (1974), in which their arms floated around their heads as they kept their eyes closed; they then performed Sticks IV (1973), a challenging task dance in which they formed one long pole with four segments, and rolled under it as they held it intact. Passing through Donald Judd's house, you get the idea from a few massive dining tables and wall of liquor bottles that he liked to eat and drink, but otherwise immerse himself in his work at one of the desks. The five stacked floors of this iconic cast iron loft building could have inspired Judd's regimented geometric sculptures, many of which are on view alongside works by Oldenburg, Dan Flaivn, Ad Reinhardt, and furniture by Alvar Aalto. Ascending the steps to the fifth floor could, hokily enough, be compared to arriving in heaven, where longtime Brown dancer and current associate artistic director Diane Madden, in a white chiffon tunic, floated through M.O. (Excerpt, 1995), to JS Bach. We viewers watched across Judd's two mattresses, with a major Flavin sculpture of red and blue neon shimmered at left. Shafts of sun speared the space, and for an hour, we were transported from the chic honky tonk of Spring Street back to an era where space, time, food, and art conspired. 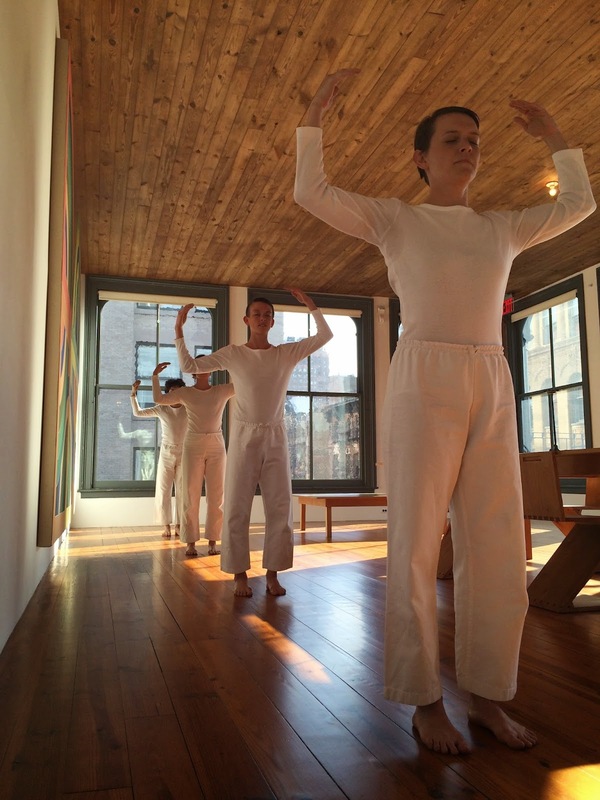 Trisha Brown's work happily continues on.